"This is a fast and filling smoothie with a deep-pink color and a rich, creamy texture." Blend oats and chia seeds together in a blender to a fine consistency. 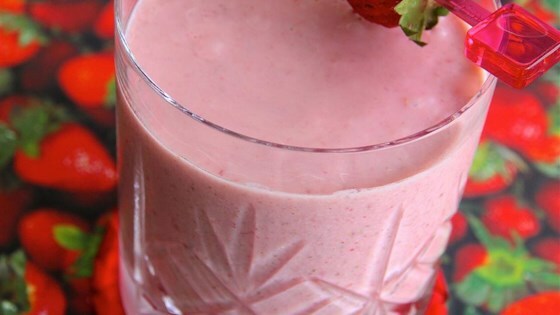 Add strawberries, yogurt, banana, almond milk, and vanilla extract; blend until smooth. I only made one change and that was using regular milk instead of almond milk. Very good. There’s no reason to skip out on the nutritional benefits of dairy, and every reason to skip the imitation of nut juice. Delicious summer alternative to hot oatmeal. I added some Agave because it wasn't quite sweet enough. Frozen strawberries aren't always the most flavorful. I used vanilla cashew milk and Greek vanilla yogurt and it turned out fantastic!